The China social networking landscape is vastly different from those in the west. The networks are local, the conversations are local, and the motives behind online chatter are different. 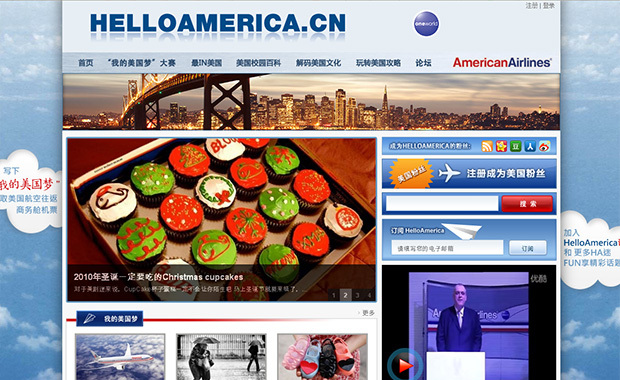 American Airlines has spent the past 12 months developing a leading online resource for Chinese traveling to America. conversations are local and the motives behind online chatter are different. months developing a leading online resource for Chinese traveling to America. content designed to help you on your USA travels. a model for all American companies to adopt. plan trips and share insights about hot spots to frequent. to pay a premium for – beyond its economical rivals. ambassadors ensures the product remains socially driven and accepted by peers. unique ploy to engage a new market. For insights, stratgeies and more when connecting with Chinese visit Mailman.